Post-vaccinal angioedema appears to be among the most common vaccine adverse events. Addressed are risk factors, treatment, and prevention of this reaction, plus reporting of vaccine adverse events. These compounds are likely responsible for the development of post-vaccinal angioedema. 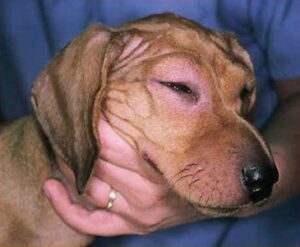 Angioedema is distinguished from urticaria (or hives), an acute pruritic allergic reaction, due to the fact that urticaria affects the superficial layers of skin. Respiratory distress (laryngeal edema) is occasionally reported in humans with acute-onset angioedema but has not been reported in dogs or cats. The periorbital tissues and muzzle are commonly affected (Figure). Affected animals typically develop localized (versus systemic) asymmetrical swelling of the skin and mucous membranes within minutes to a few hours following administration of a vaccine. Limited studies in affected dogs indicate that vital signs and laboratory profiles tend to be normal. 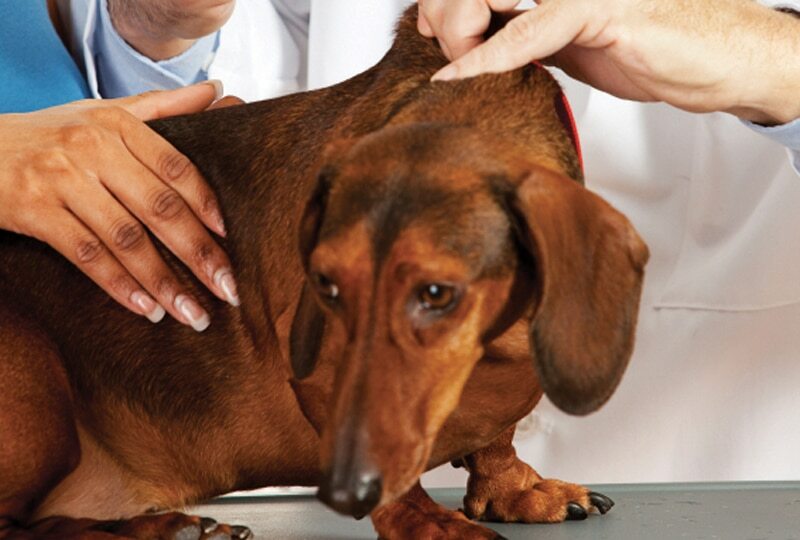 Although some animals may appear to manifest mild discomfort associated with the swelling, pruritus is uncommon. 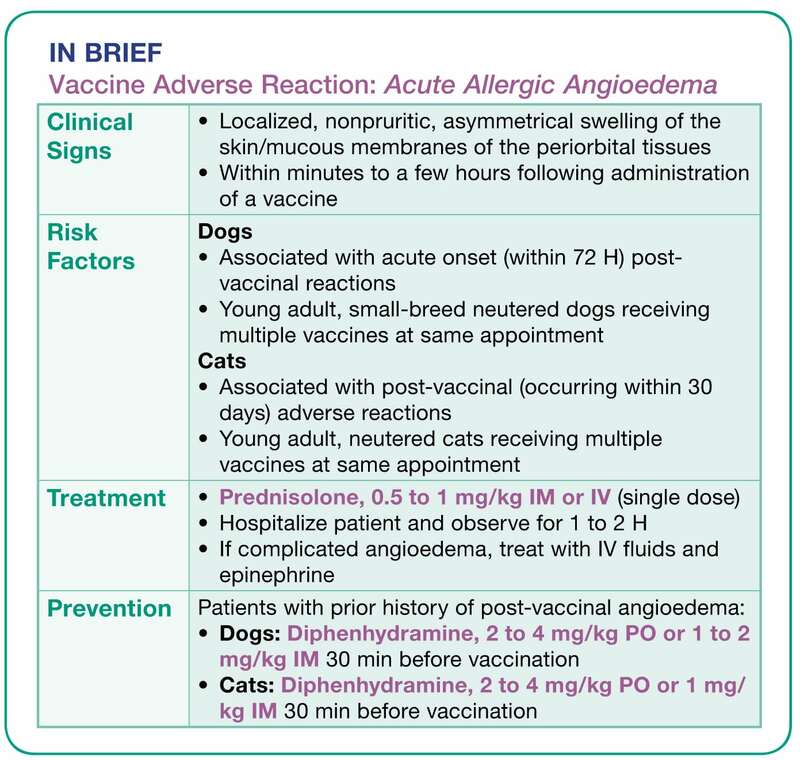 The true incidence of post-vaccination angioedema is unknown due to limited reporting and the absence of a meaningful, accessible adverse event database for veterinary medicine. Lack of data further complicates the compilation of key epidemiologic information, such as type of vaccine(s) administered, prior vaccination history, patient age, breed, and gender, which could facilitate efforts by veterinarians to reduce reactions or mitigate risk during subsequent vaccine appointments. While acute-onset angioedema is anecdotally reported to be associated with administration of leptospirosis vaccines, the reaction has occurred in dogs that have never received a dose of leptospirosis vaccine. In addition, similar post-vaccinal reactions have been observed in cats. Inactivated vaccines, such as rabies and Lyme borreliosis, as well as attenuated (modified-live) vaccines have been implicated. The specific antigen(s) responsible for causing acute angioedema may not, in fact, be associated with the immunizing antigen. Excipient proteins and associated chemicals typically found in many vaccines (eg, bovine serum albumin, adjuvant, antibiotic) may act as a sensitizing allergen in an individual animal. For this reason, simply changing vaccine manufacturers does not guarantee that the reaction will not reoccur in a patient with a prior history of angioedema. Urticaria (hives) and pruritus are not commonly associated with post-vaccinal angioedema. Risk factors for cats are similar and suggest that post-vaccinal (occurring within 30 days) adverse reactions were most likely to occur in young adult, neutered cats that receive multiple vaccine doses at the same appointment.7 However, these studies assessed the occurrence of multiple types of adverse reactions and were not limited to angioedema. Interestingly, there are no studies documenting increased risk for adverse reactions at the time of revaccination among patients with a prior history of post-vaccinal angioedema. Vist bevaccinesmart.com—a website that offers vital information for both veterinarians and pet owners—to find comprehensive coverage on the importance of vaccination, history and perception of vaccines, clinical signs to watch for after vaccination, resources practitioners can use within their practices, and much more. Preventive measures for patients with a prior history of post-vaccinal angioedema. Because it is not possible to predict which patients will have mild, self-limiting signs and which ones will develop severe swelling or systemic anaphylaxis, treatment of any patient with evidence of post-vaccinal edema is justified. Parenteral (IM or IV) administration of a single dose of prednisolone, 0.5 to 1 mg/kg, is expected to be sufficient. Ideally, the patient should be hospitalized and observed for at least 1 to 2 hours to determine if the signs worsen or respiratory distress develops. Administration of an antihistamine, such as diphenhydramine, is not contraindicated. However, a patient is unlikely to benefit significantly from a dose of an H-1 inhibitor once histamine has been released and tissue swelling has developed. Treatment with IV fluids and epinephrine is not indicated in the patient with uncomplicated angioedema. Although reporting of vaccine adverse events in the U.S. and Canada is voluntary, veterinarians are encouraged to report known and suspected adverse reactions. Veterinarians are encouraged to report vaccine adverse events to the Technical Services section of the manufacturer of the product(s) suspected to have caused the reaction prior to contacting the regulatory agency, the USDA Center for Veterinary Biologics (CVB). Veterinarians are encouraged to contact the manufacturer of the product(s) believed to have caused the adverse event. Alternatively, veterinarians can report a vaccine adverse event to the Canadian Food Inspection Agency (CFIA) by accessing Form CFIA/ACIA 2205: Notification of Suspected Adverse Events to Veterinary Biologics, available at http://inspection.gc.ca/english/for/pdf/c2205e.pdf. In addition, many clinicians elect to administer treatment prior to vaccination to mitigate potential risk associated with revaccination; however, the benefits an individual patient derives from pre-vaccination treatment have not been studied. Cats: Administration of a single dose of diphenhydramine, 2 to 4 mg/kg PO or 1 mg/kg IM. IV administration of diphenhydramine is NOT recommended in these patients. Anecdotally, some practices recommend administering both an antihistamine and corticosteroid prior to revaccination. Welborn LV, DeVries JF, Ford R, et al. 2011 AAHA Canine Vaccination Guidelines. JAAHA 2011; 47:1-42; available online at jaaha.org. Meyer EK. Vaccine-associated adverse events. Vet Clin North Am Small Anim Pract 2001; 31:493-514. Roth JA. Mechanistic bases for adverse vaccine reaction and vaccine failures. Advances Vet Med 1999; 41:681-700. Frana TS, Clough NE, Gatewood DM, Rupprecht CE. Postmarketing surveillance of rabies vaccines for dogs to evaluate safety and efficacy. JAVMA 2008; 232:1000-1002. Moore GE, HogenEsch H. Adverse vaccinal events in dogs and cats. Vet Clin Small Anim Small Anim Pract 2010; 40:393-407. Moore GE, Guptill LF, Ward MP, et al. Adverse events diagnosed within three days of vaccine administration in dogs. JAVMA 2005; 227:1102-1108. Moore GE, DeSantis-Kerr AC, Guptill LF, et al. Adverse events after vaccine administration in cats: 2,560 cases (2002-2005). JAVMA 2007; 231:94-100.